Version 17.12 is now available for DOWNLOAD! Shotcut tries hard to let you edit with many audio and video formats directly without a conversion or import process. However, like most video editors, there are some things that it simply cannot handle such as variable frame rate. Unfortunately many screen, game, and device capture tools create such files. Also, in order to support editing, Shotcut must be able to seek to a frame. This version now tries to detect if a file is variable frame rate or non-seekable and present a dialog to Convert to Edit-friendly format. To keep the process rather simple but still satisfy different users’ needs, it offers 3 pre-defined options. More than likely, all of them will create a file that is larger than the original, which is normal. However, at least you get some choice. In addition, Shotcut (via MLT & FFmpeg) only does a basic seek test. When it succeeds, it is still not guaranteed to be frame accurate—that depends on many factors: format, codec, parameters of codec, the tool that wrote it, FFmpeg’s code, MLT’s code, versions, etc. There is simply no good way to reliably test for that at the moment. Also, even when seeking works, some files and the way they were encoded seek slowly and may require Settings > Interpolation > Bilinear or better to increase accuracy making it even slower. 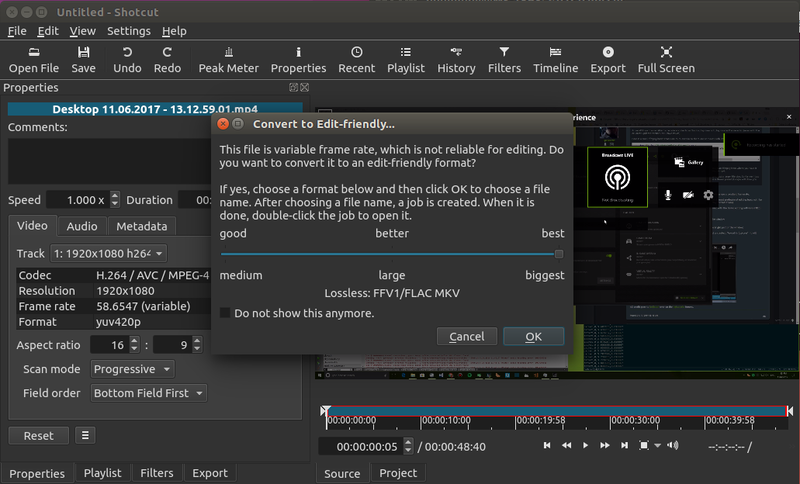 Therefore, you can choose to convert any audio or video clip to one of the edit-friendly (frame accurate and relatively fast-seeking) formats by using Properties > Menu > Convert to Edit-friendly….